Update: People are beginning to gather in Charlotte again and it appears their may be a second night of riots. Reportedly, riot police are already using tear gas and rubber bullets in an effort to disperse a growing crowd. Click here for a livestream of the riots currently taking place in Charlotte. On September 20th, riots broke out near the campus of UNC-Charlotte after Charlotte-Mecklenburg police shot a man while searching for a different man wanted on a warrant. 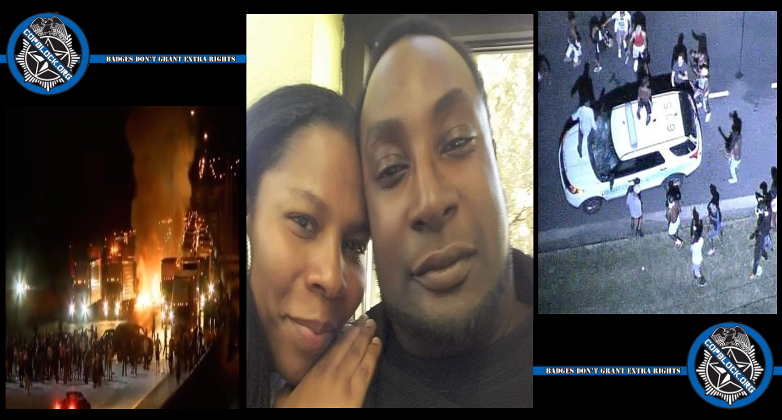 Police claim that the man they killed, identified as Keith Lamont Scott, had stepped out of his car with a gun and then subsequently got back inside. They then claim he got back outside of the vehicle after they approached and posed an “imminent deadly threat” to them, necessitating his shooting. According to CMPD Police Chief Kerr Putney, some of the officers at the scene were wearing body cams and there is also video from dash cameras, but he hasn’t reviewed the footage yet and he is predictably refusing to release it using various excuses. In addition, North Carolina recently passed a law restricting the public’s access to police shooting videos. So, it’s unlikely that any video will be released unless it clearly supports the police narrative of what happened, regardless. The shooting ― the sixth Charlotte-Mecklenburg police killing of a civilian in the past year ― happened just before 4 p.m. at an apartment complex roughly a mile from the University of North Carolina at Charlotte. Charlotte-Mecklenburg Police Department officers were searching at the complex for someone else who was wanted on an outstanding warrant, police said in a statement. During the search, officers said they saw a man exit a vehicle with a firearm, then get back inside. When police approached, the man got out of the vehicle again and “posed an imminent deadly threat to the officers who subsequently fired their weapon striking the subject,” according to the police statement. Police said they called a medic and administered CPR. Scott, 43, died at the hospital. Police identified the shooter as Officer Brentley Vinson, who has worked for the department since July 2014. Vinson is black. Witnesses, however, testified that he was disabled and was “armed” only with a book. Later, Scott’s brother stated that Keith Scott was reading the book while waiting to pick his son up from a school bus prior to the incident that led to him being shot. Scott’s sister also stated that he was unarmed when he was shot. Family and other witnesses also stated that the police involved in the shooting were dressed in plain clothes, rather than in police uniforms. Lyric Scott, Keith’s daughter, posted an hour-long video of the family confronting the police afterwards, via Facebook Live. During the video she stated, “The police just shot my daddy four times for being black.” Soon after, hundreds of protesters began converging on the location where Keith Scott had been shot.